Sorry that I haven't been able to post anything for almost a year, but my new gig has kept me away from everything including my better half. Will try to post at least twice a month from now. 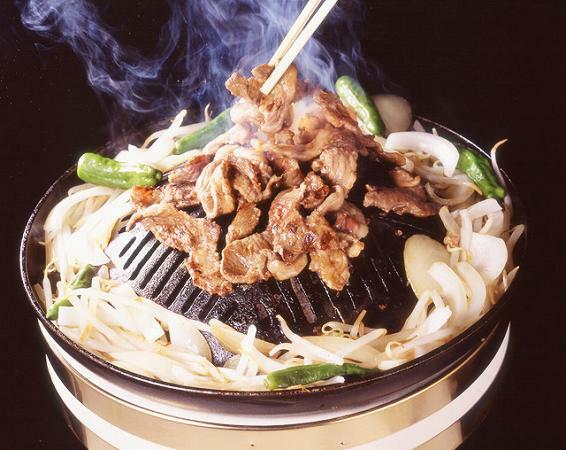 Japanese people just love Korean BBQ, but that is Yakiniku (Japanese style Korean BBQ) and I think any foreigner would admit that they love it as well. 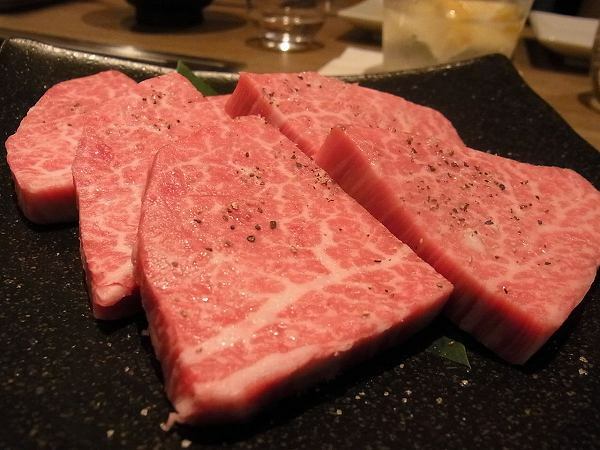 There are just so many Yakiniku restaurants in Tokyo, but if you are looking for a place where you can use for a date or business dinner and still have top beef, USHIGORO at Nishi Azabu is one of the new trendy Yakiniku restaurants in Tokyo. 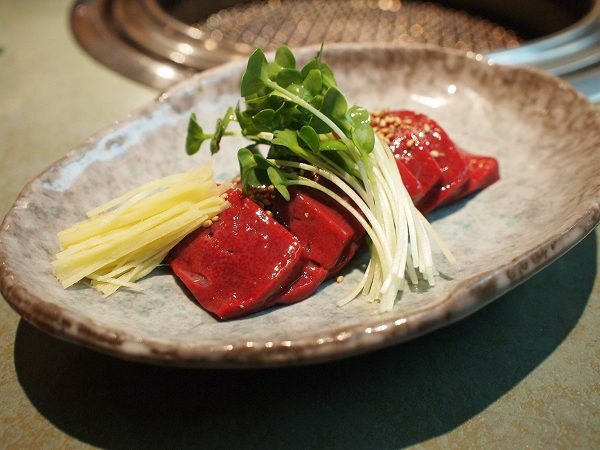 You can order a la carte at Ushigoro, but my recommendation is to order their most expensive course called KIWAMI COURSE for 10,000 yen per person. 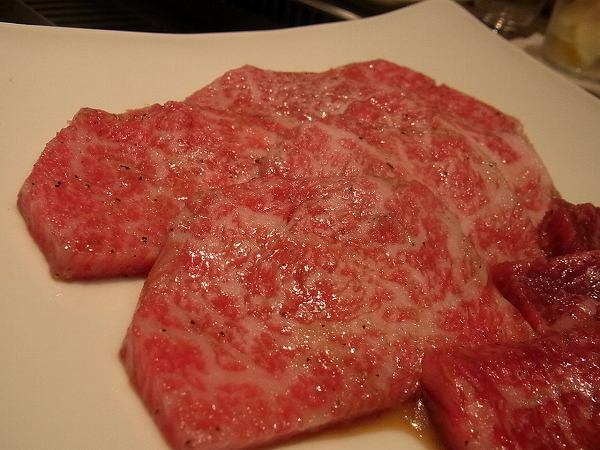 Kiwami means "The Best" and the beef is exceptional for this price. It starts out with a thinly sliced Sirloin. It's just cooked for a few seconds and then they roll it, deep it in an egg sauce and you eat at one bite. 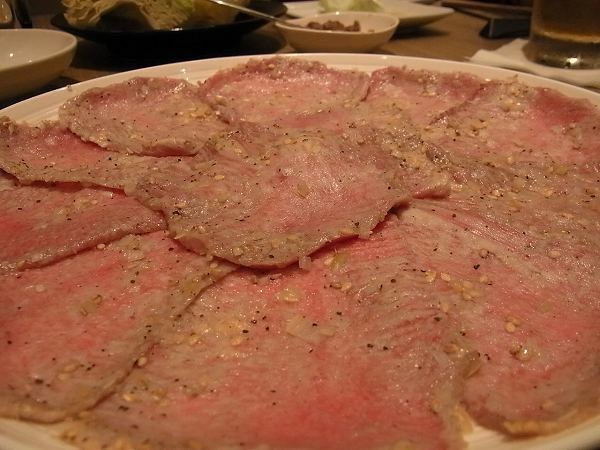 Next is Tongue which is also thinly sliced. It's rare to see such thinly sliced tongue. This is also just cooked for a minute or two. Various parts of beef are provided. 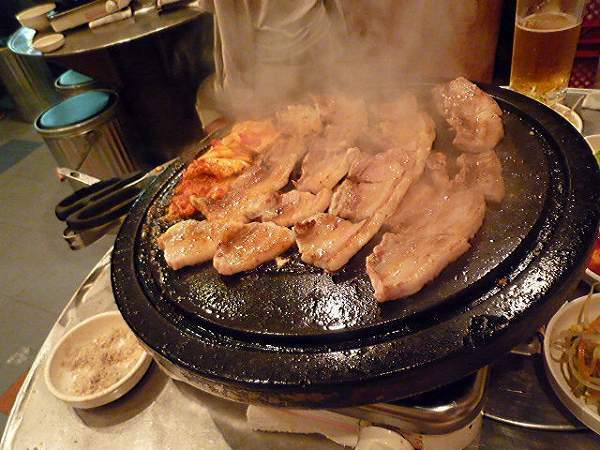 It usually depends on the day, but HARAMI (Skirt), TOMOSANKAKU (Top lound), KALBI (Short plate) mostly served. 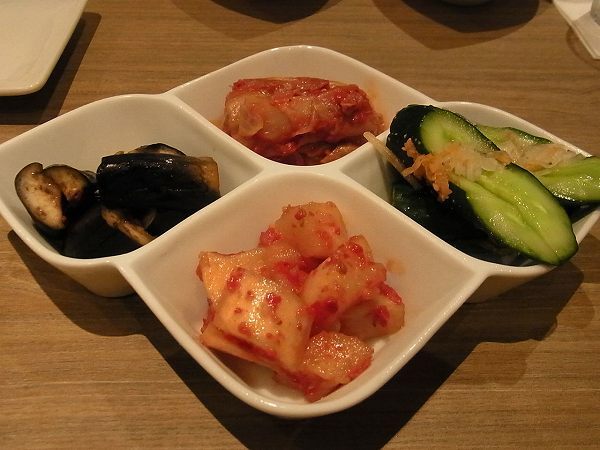 Of course, KIMCHI (Spicy pickles) and NAMURU (Light boiled seasoned vegetables) come with the course. 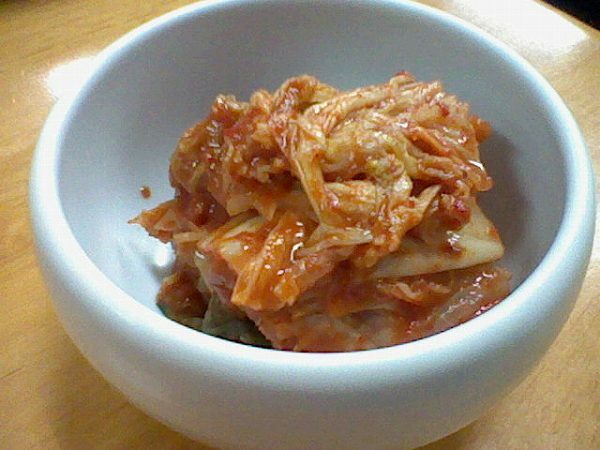 Stomach parts like MINO (Tripe) is in the course and not chewy at all. But the best part is CHATEAUBRIAND (center part of tenderloin). 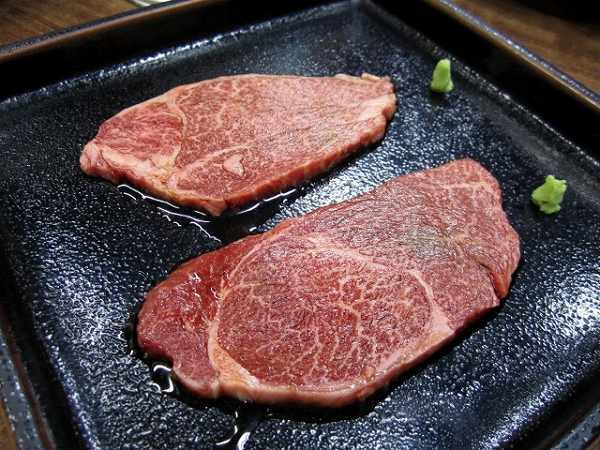 It is unbelievably tender and juicy. 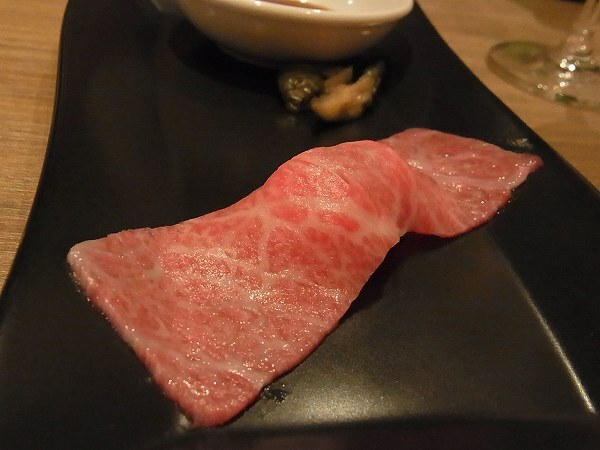 By far, my favorite part of beef at Ushigoro. 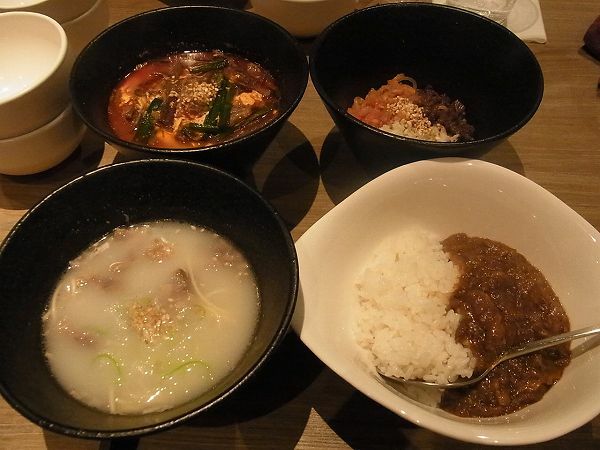 At the end, you get to choose from BEEF CURRY and a couple other soup rice dishes before desert. 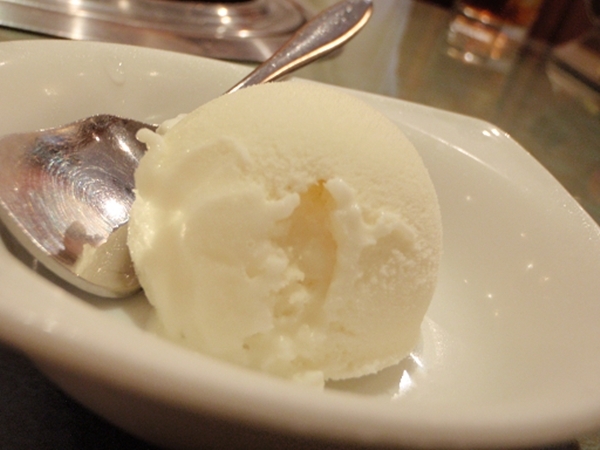 And of course, just like any Yakiniku restaurant they offer simple deserts like ICE CREAM, and ANNINTOFU (Almond jelly). 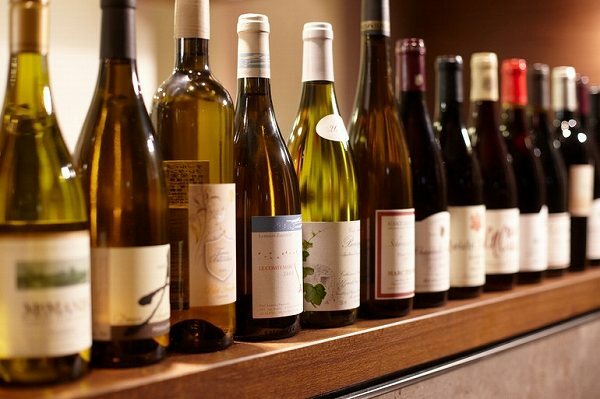 For a yakiniku restaurant, Ushigoro has an amazing wine list. I've never seen such a wine list at at yakiniku restaurant. Plus the prices are very reasonable. Make sure you make a reservation a couple of days in advance. 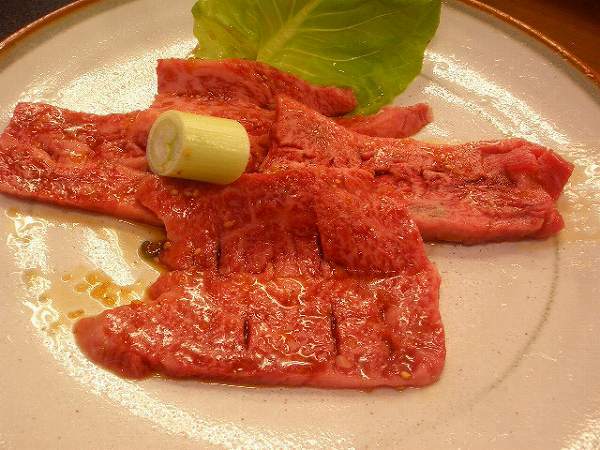 It is not down to earth Yakiniku, very modern, but if you are looking for a non-smoky Yakiniku restaurant with top beef and service, Ushiroku is for you. 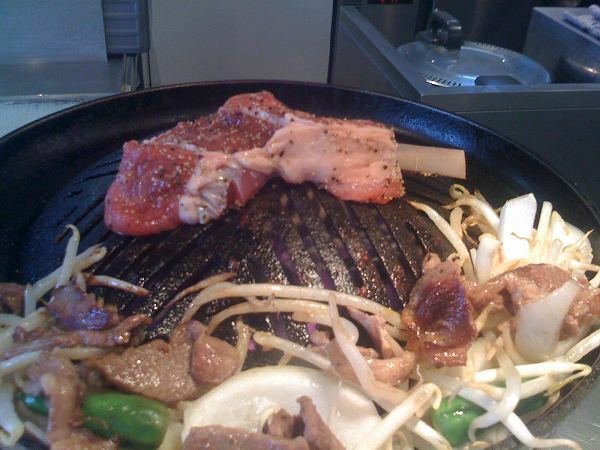 Most people have a favorite yakiniku (Japanese style Korean BBQ) restaurant in their neighborhood. These restaurants are focused on family, not businessmen after work and ours is ICHIRYU at Komazawa. 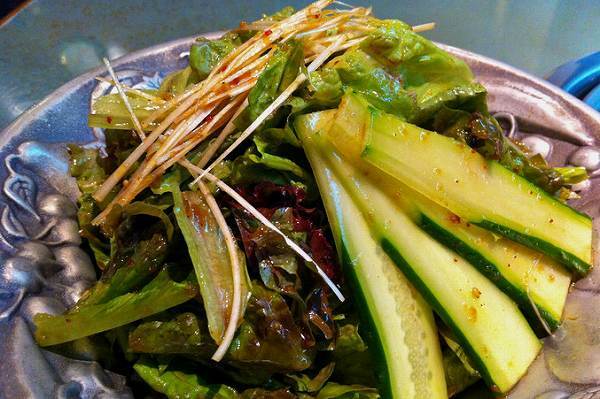 Their house salad, MUNCHU for 1,200 yen is a must as well. 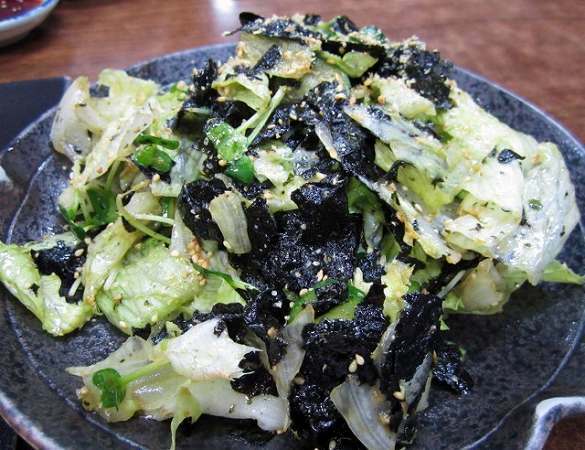 Its in a soy sauce & sesame oil based dressing. MINO (Marinated or salted rumen) , which all come in various grades. The higher the grade of the meat, the higher the price. 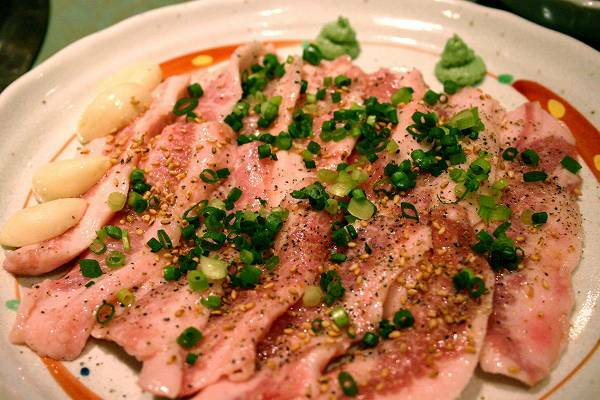 If you want some pork, there is TON TORO (Marinated or salted pork cheek), which is extra juicy and tender. 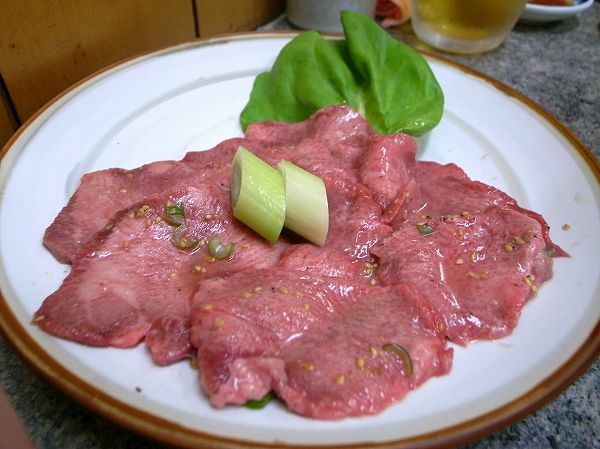 If you like raw meet, their NAMA LIVER (Raw beef liver) for 1,250 yen is always extra fresh and delicious. 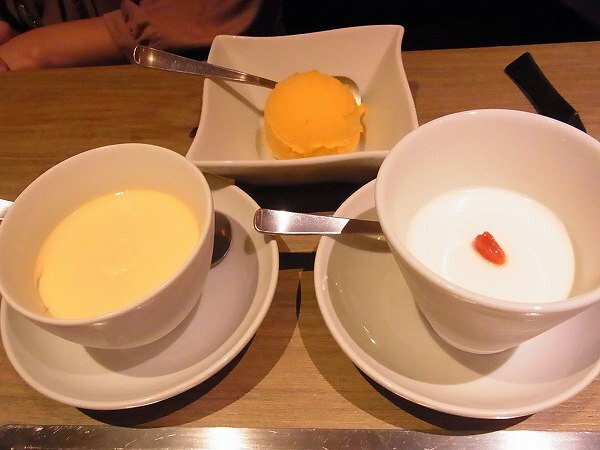 When you are done with your meal, they will serve either ice cream or sherbet for free. 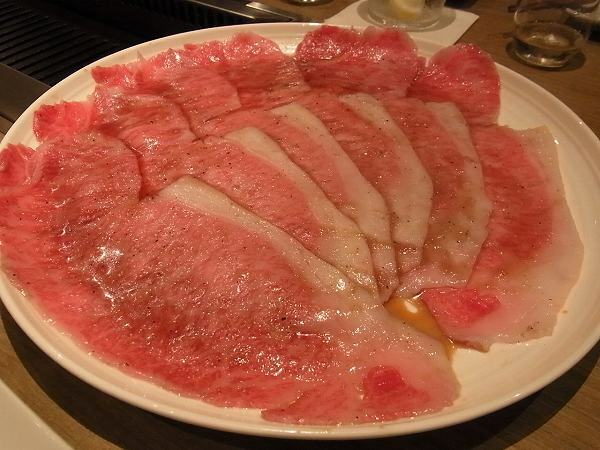 If you just happened to be in the neighborhood and looking for a reasonable and delicious yakiniku restaurant do try Ichiryu. 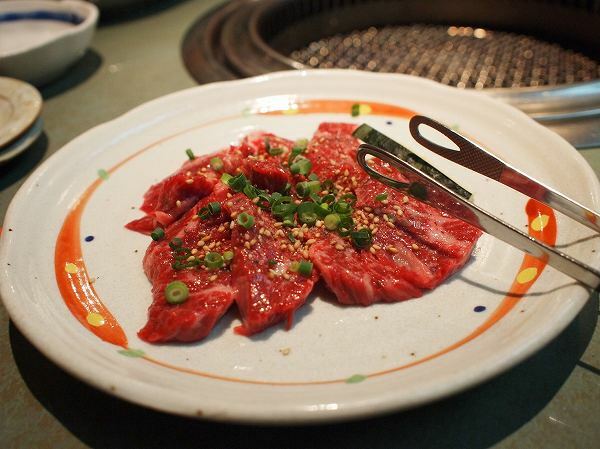 Do note that Ichiryu is a common name used for a yakiniku restaurant and there are at least 20 with the same in Tokyo. 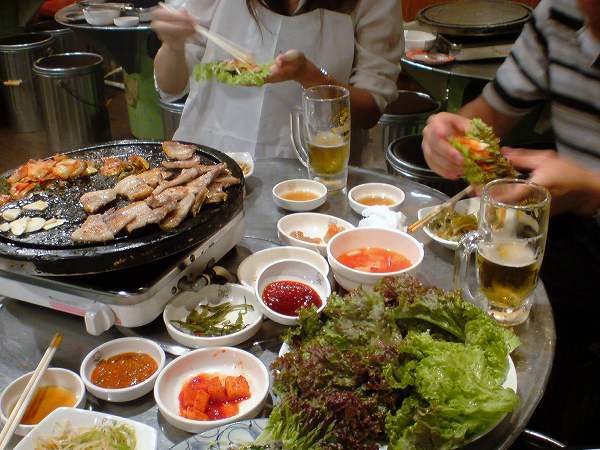 Japanese style Korean BBQ better known as Yakiniku was invented by Korean's living in Japan after World War II. 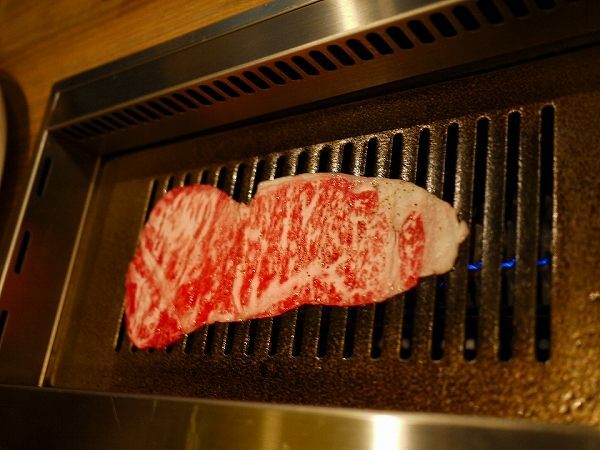 It is different from real Korean BBQ, but unless you can't or don't eat beef, most people will say that Yakiniku is one of their favorite foods. 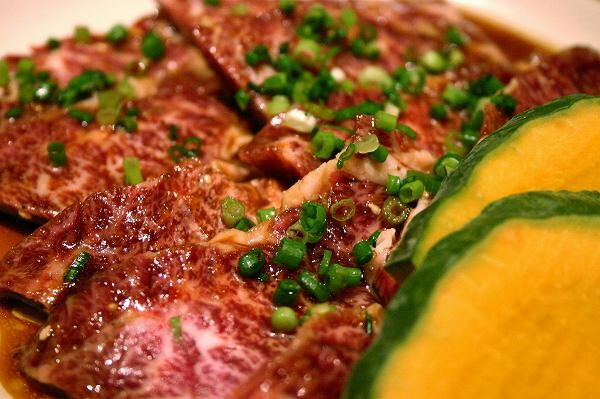 Almost everyone has their favorite Yakiniku restaurant, but the most famous one and considered the best to many is SUTAMINAEN at Shikahama. So what makes Sutaminaen special? Well its not only the quality of meat, but how the owner/chef trims it. They use an old fashion steel plate and gas grill which you don't see much anymore. 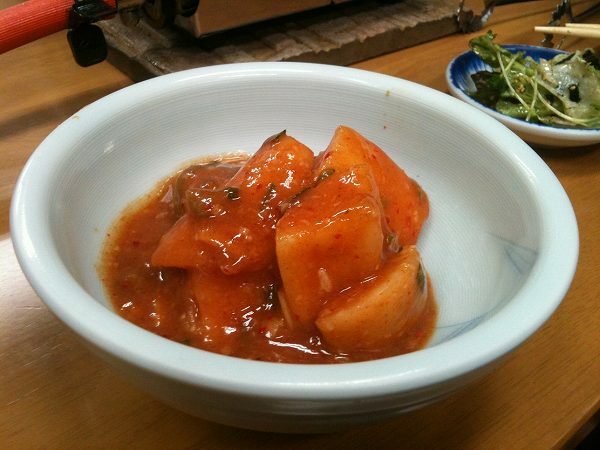 or KIMICHI (Spicy pickled radish or Chinese cabbage). 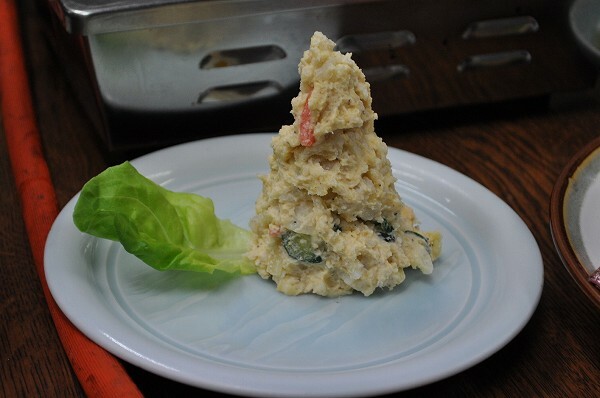 Their POTATO SALAD is famous as well. 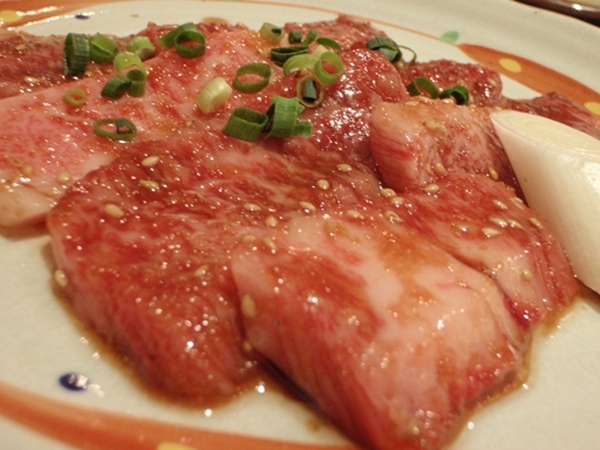 Then move on to JYO TAN SHIO (Special tongue) for 1,800 yen just like any other Yakinuku restaurant. 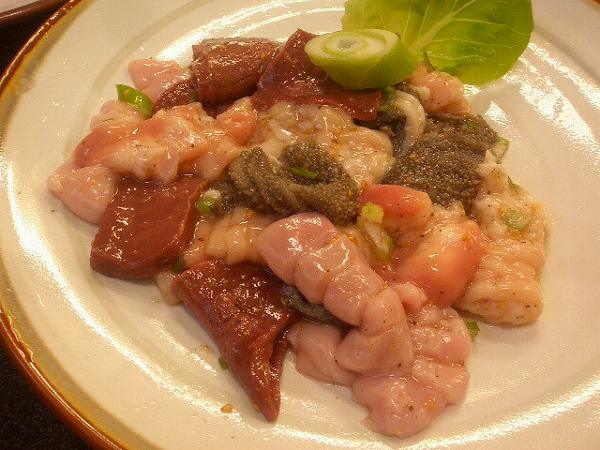 Next would be their specialty MIX HORUMON (Various guts) for 1,700 yen. By far this is the best horumon I ever had. 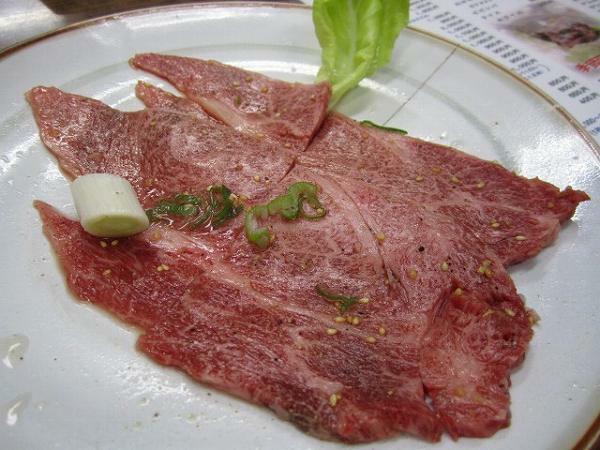 or if you want to try the best its TOKUSEN JYO KARUBI (Prime boneless short rib) 1 slice 1,200 yen. 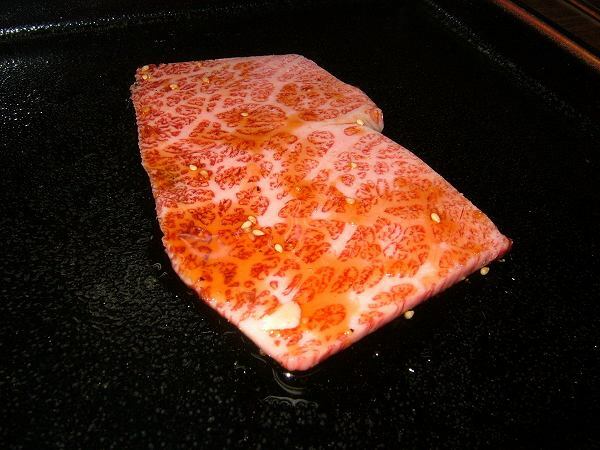 or JYO ROSU (Special loin) for 2,400 yen, which is thinner. 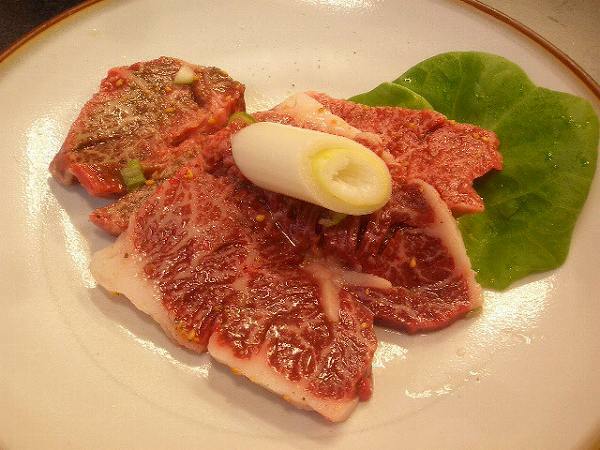 and GYI HIRENIKU (Filet Migion) for 2,200 yen as well. 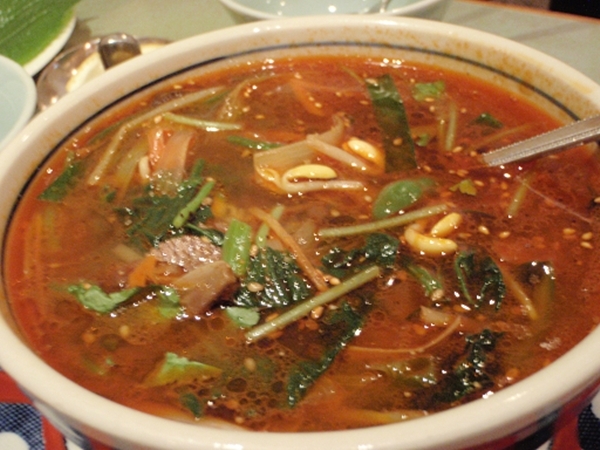 or KOMUTAN (Beef soup) 1,100 yen. They are both delicious. Sutaminaen is located in one of the most inconvenient locations. They do have a parking lot, but if you are taking public transportation, you need to take a bus or taxi from the nearest train station. Also, the wait can be crazy on weekends. Former Prime Minster Obuchi was a regular of Sutaminaen but even him with his secret police guards had to wait on line like any other customers. 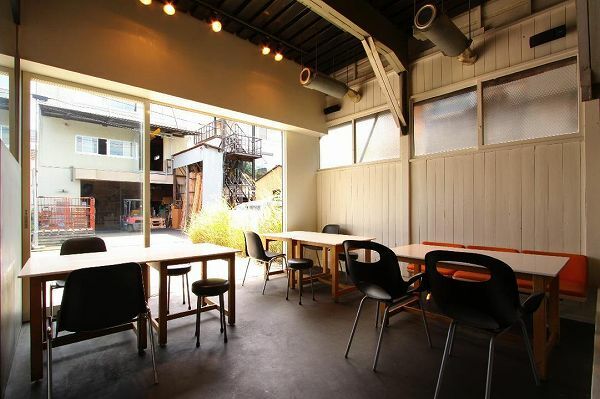 If any of your friends is a regular at Sutaminaen, the owner will serve several dishes which aren't on the menu. These are not only special but great as well. 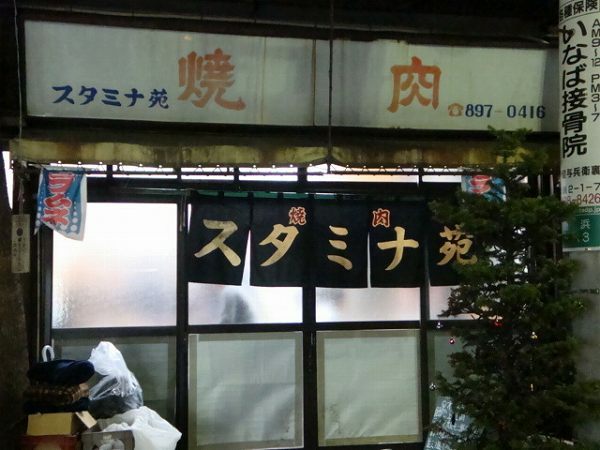 Its not a pretty restaurant at all and needs serious renovation, but people from all over Japan want to eat here and once you do I'm sure you will be back even with the crazy wait or inconvenient location. 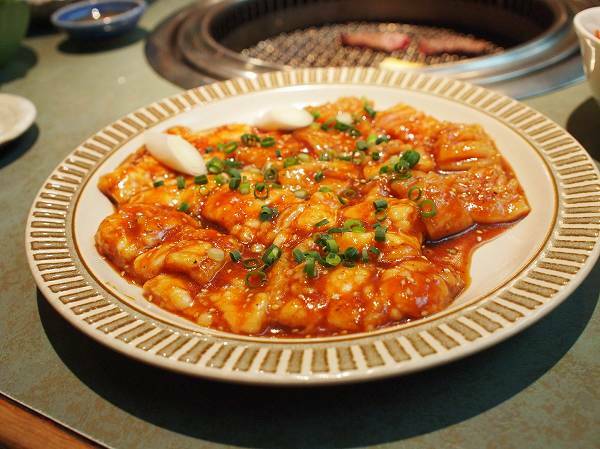 JINGISUKAN is from Hokkaido, where its the most popular & common BBQ they eat. 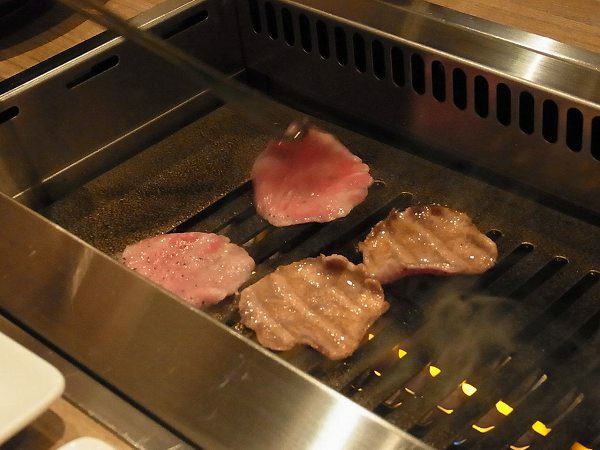 (at home, outdoors and restaurants) There weren't many Jingisukan restaurants anywhere else in Japan, but about 6 years ago, a boom came since mutton/lamb meat has less calories than any other meat and woman jumped on it. 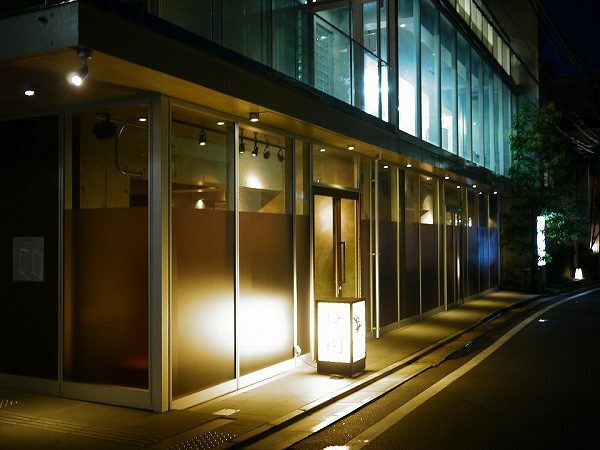 Because of this many restaurants in Tokyo opened. In the beginning, people thought it was just another boom, but it turns out it wasn't. 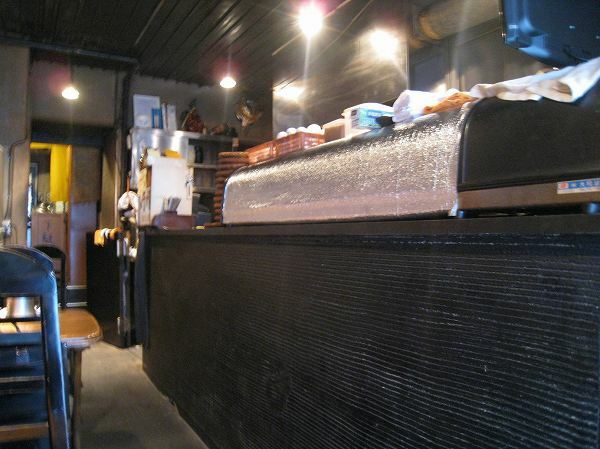 And one of the first shops to open and good one is KUROHITSUJI at Nakameguro. Jingusukan is a pretty simple BBQ. Its slices of mutton meat with bean sprout and onions. The word Jingusukan actually comes from Genghis Khan, the famous ruler of Mongol. 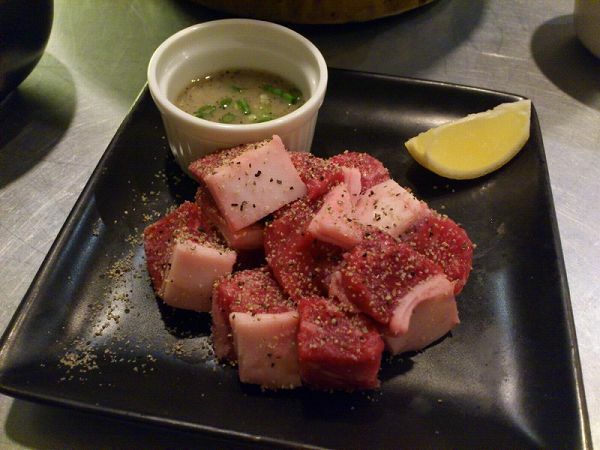 People in Hokkaido, eat marinated mutton, but in Tokyo non flavored mutton is more popular than marinated mutton. 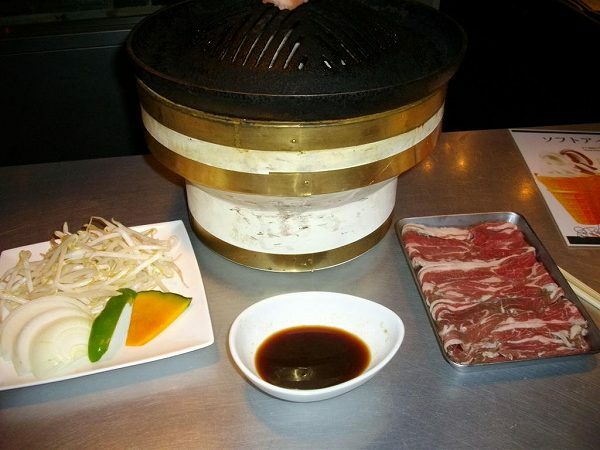 When its cooked, you dip it in a soy sauce based sauce. In my opinion, its this sauce which separates the good restaurants and not so good restaurants, more than the quality of mutton/lamb. 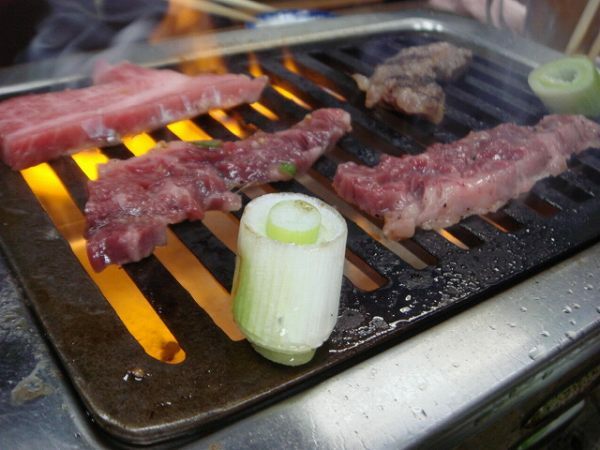 Put bean sprouts and onions on the grill first and keep the center part open so there is room to put the meat. Just grill it til its ready and dip it in the sauce before it goes into your mouth. 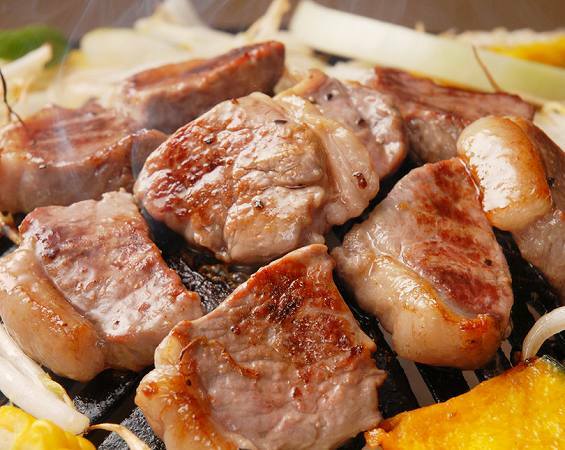 JINGISUKAN (Mutton BBQ with vegetables) is 1,000 yen. 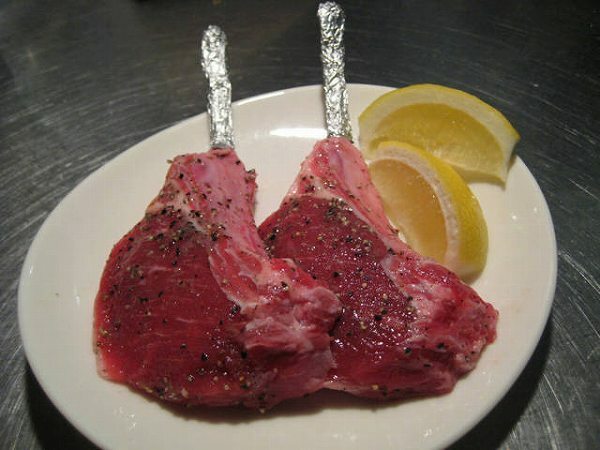 or LAMU CHOP (Lamb chop) for 480 yen per piece. 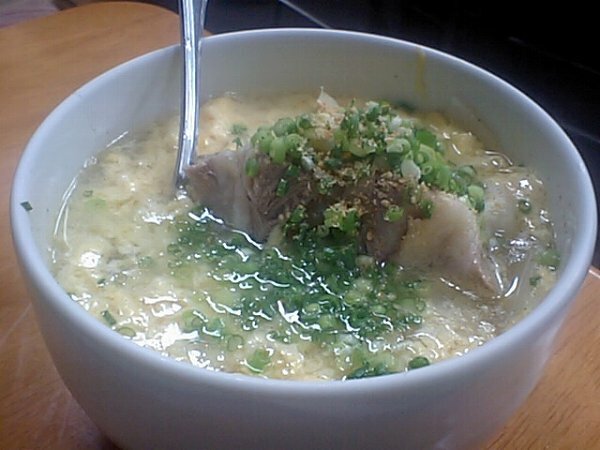 You can have a bowl of rice with this, but I recommend to have try their ramen, which is called ZEPPIN RAMEN for 480 yen. 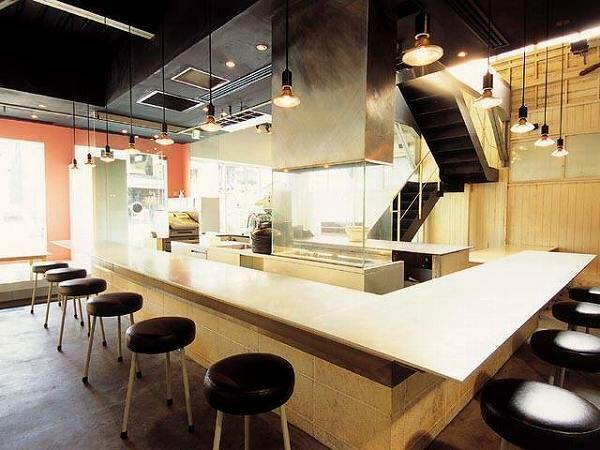 The interior is simple, but modern unlike other Jigisukan restaurants, but do remember that it is very smoky inside. 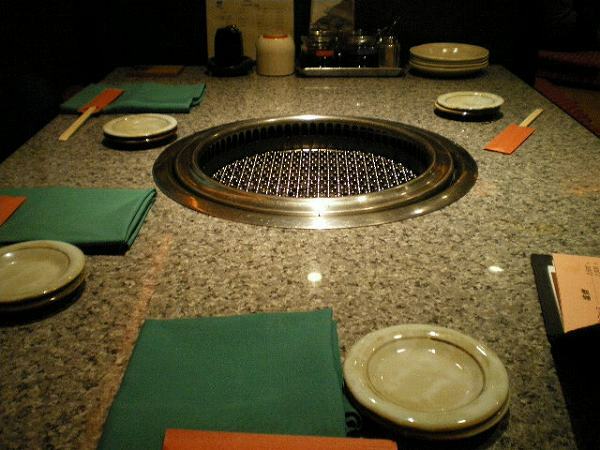 If you don't have a reservation, the wait can be over a hour so I strongly recommend to make one. Also, for weekends they are open for lunch as well. 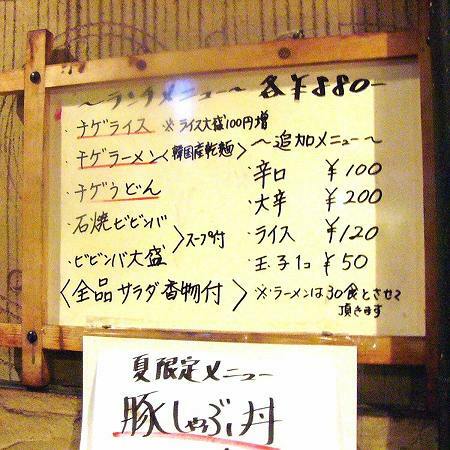 Unless you over drink, they bill per person should be somewhere between 3,000-5,000 yen. 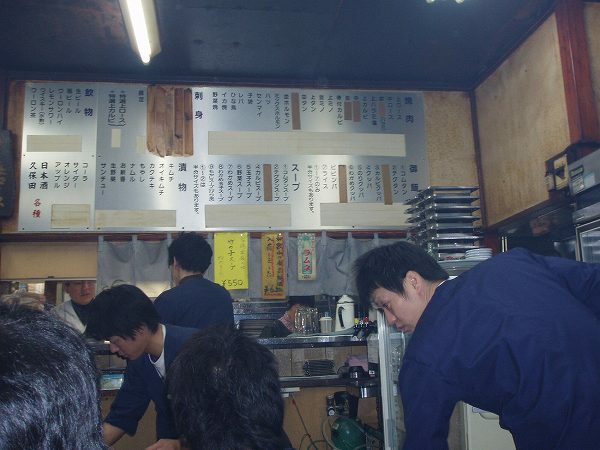 When the weather is cold, one of my favorite lunch restaurants in Tsujiki is TSUKIJI TOHGARASHI. Tohgarashi is actually a Yakiniku restaurant (Japanese style Korean BBQ) at night, but their CHIGE (Spicy hot stew....in Korean it is actually spelled Jjigae, not Chige) at lunch is known to almost anyone who works at Tsukiji. 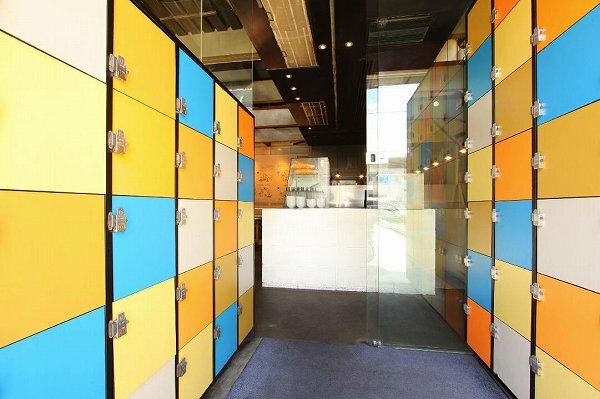 Its located only a couple of minutes away from Tsukiji Fish Market and you will never see tourists, only office workers coming for lunch. The building is almost like a shack and the inside isn't pretty to say the least, but their Chige is by far the best lunch Chige I ever had in Tokyo. Before you walk into Tohgarashi there will be a menu hanging outside on their door. 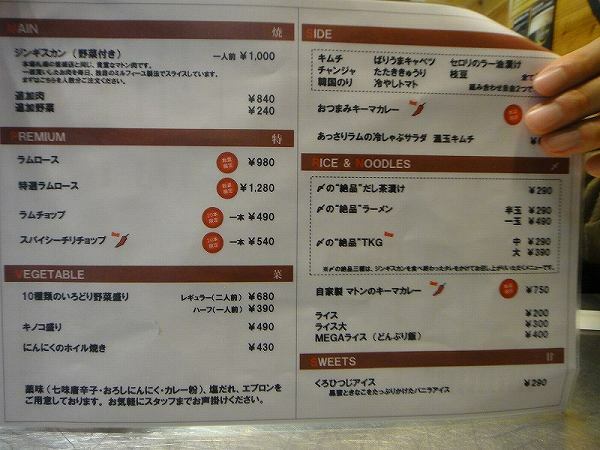 The menu is pretty simple since there are only 5 items to choose from. 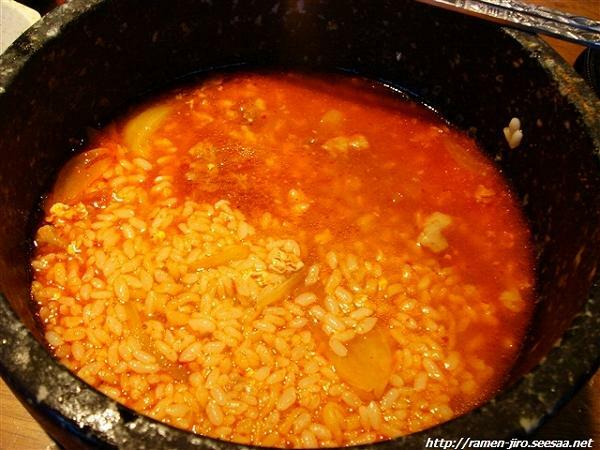 The second popular dish is CHIGE UDON (Spicy Hot Stew Udon) for 880 yen. 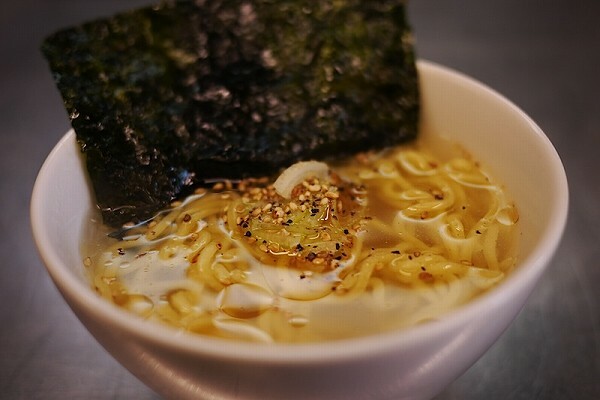 The only difference between Chige Ramen and Chige Udon is the noodles. 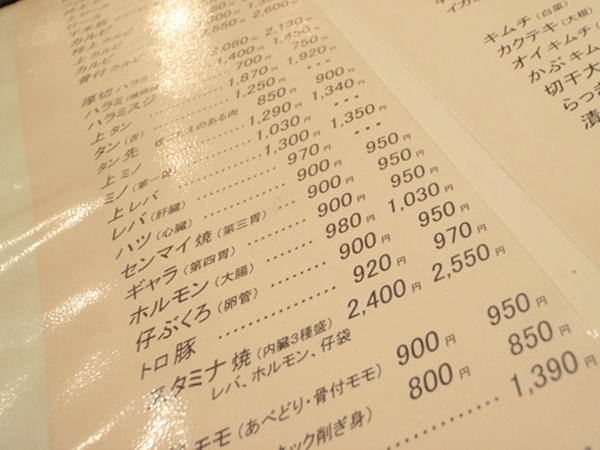 And then, they just have CHIGE RICE (Spicy Hot Stew with Rice) for 880 yen. This doesn't have any noodles and instead it comes with a bowl of rice. If you want an extra large rice its an additional 100 yen. 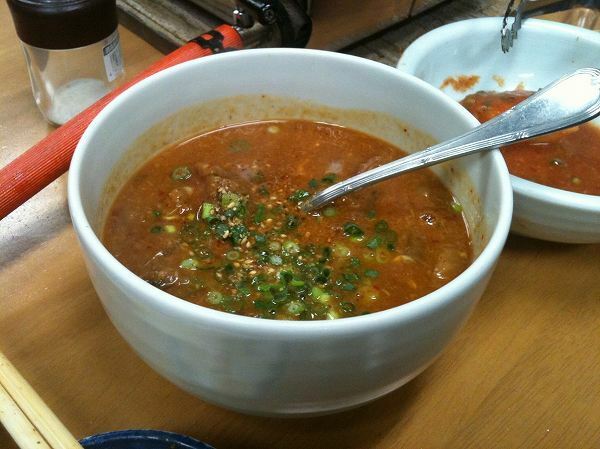 You can also make all the Chige's spicier if you prefer for an additional 100 yen or even extra spicy for 200 yen. You can also add an egg for 50 yen as well. Some customers add the rice into soup like the above. 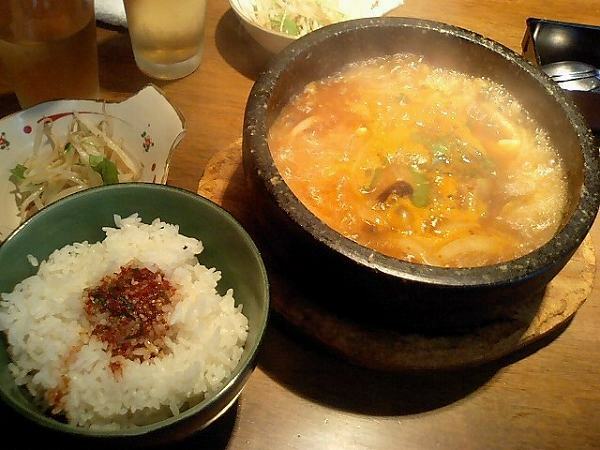 Besides Chige, they have ISHIYAKIi BIBINPA (Vegetables & Grounded Beef over Rice in Hot Stone Bowl) for 880 yen. They also have regular BIBINPA (Vegetables & Grounded Beef over Rice) for 880 yen. I've have never ordered these two dishes, so I can't comment on how good it is. I wouldn't recommend going to Tohgarashi during the summer since you will be sweating so much while you are eating. I've never had dinner here so never tried their Yakinuki and therefore can't comment on what dinner is like, but if its a cold day and want to eat something warm for lunch, I can't think of a better place in Tsukiji then Tohgarashi's Chige. I took my wife here for the first time in January and the only words she said while she was eating was "Oishii" meaning delicious. 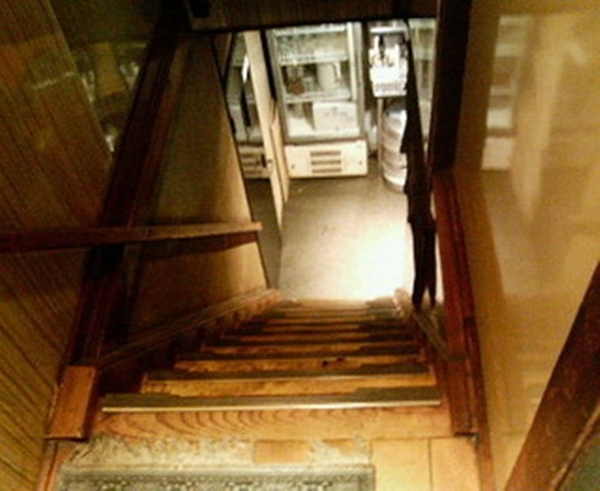 Try to get to Tohgarashi before 12:30pm because a couple of dishes will be sold out by then. 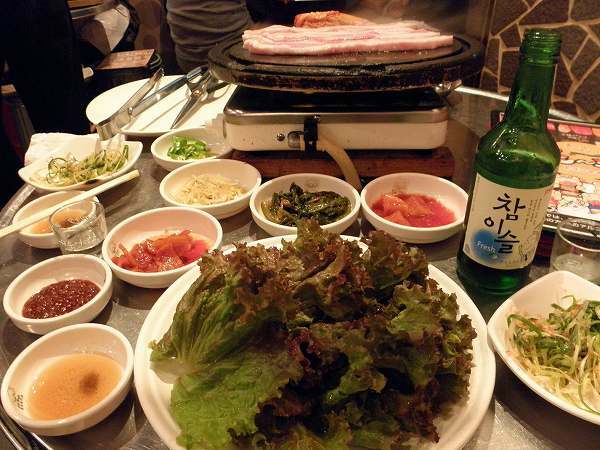 First time I had SAM GYEOP SAL (Pork Belly BBQ) was in Seoul, 1992. 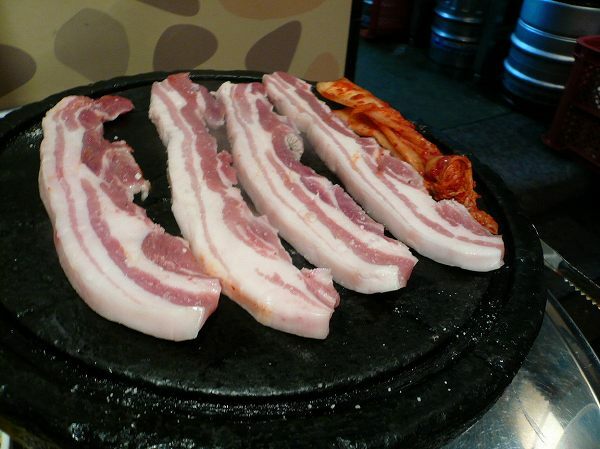 I've had Korean beef BBQ many of times, but never pork belly BBQ. 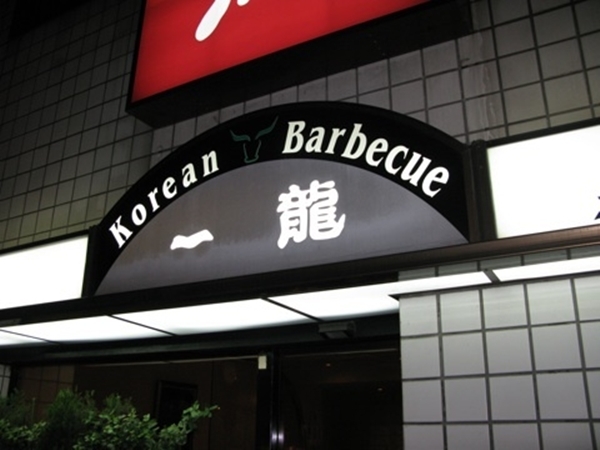 It was so delicious and the most common BBQ ate in Korea, but couldn't find one restaurant in Tokyo that specialized in it. 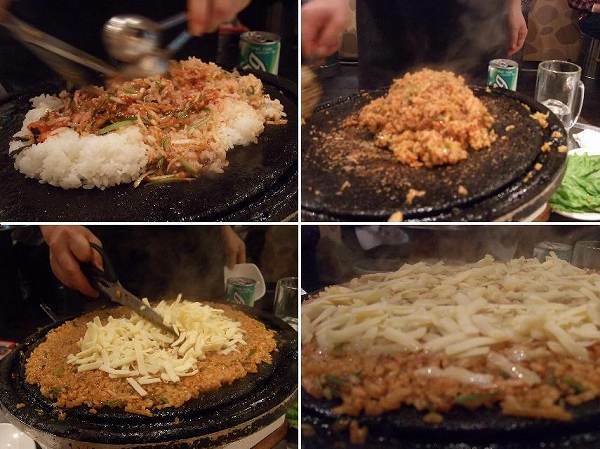 So, the only time I would eat it is when I would go back to Seoul for business. 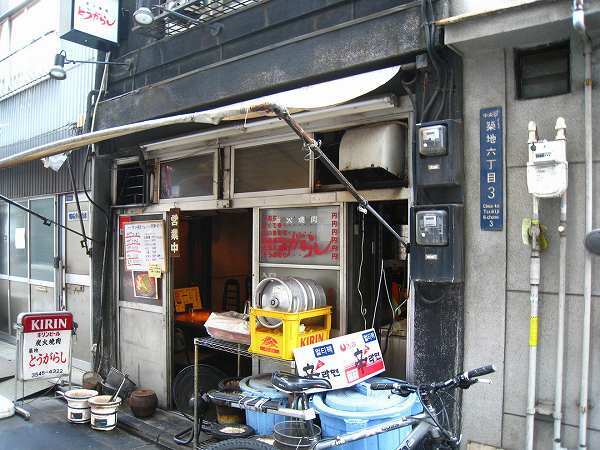 10 years later in 2002, I was going to a meeting in Shinjuku and just happened to past by Tokyo's 1st Sam Gyeop Sal restaurant, TONCHANG on its opening day. It was as good as the best Sam Gyeop Sal restaurants in Seoul, but for the 1st year or so customers were only Korean people and I was one of the very few Japanese customers. But a year later, a Korean celebrity introduced Tonchang on a TV program and from the next day on, too many people found out how good Sam Gyeop Sal/Tonchang is. 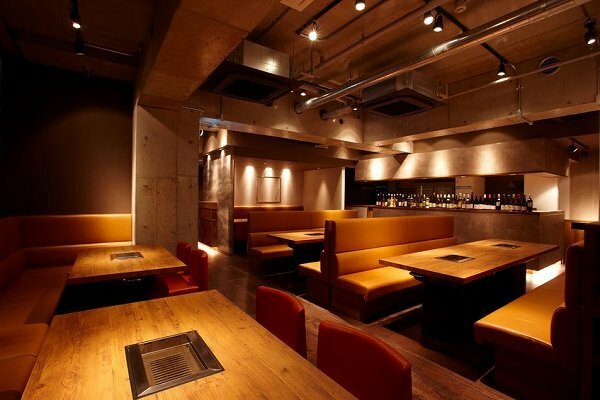 Now there are over 10 Tonchang restaurants in Tokyo, but I go to Akasaka branch since it was close to my old office. 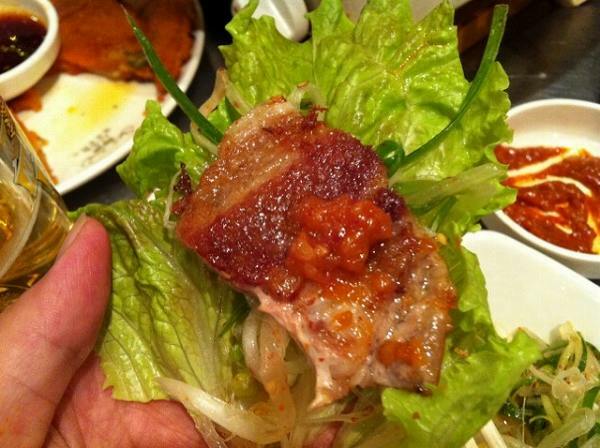 Tonchang has various kinds of pork BBQ, but want you want to order is Sam Gyoep Sal Set (Pork Belly Set) 1,029 yen. 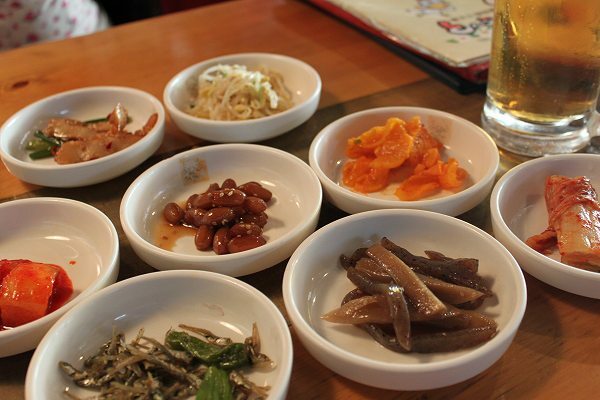 Sam Gyoep Sal Set comes with various side dishes, which are all delicious and free of refills. 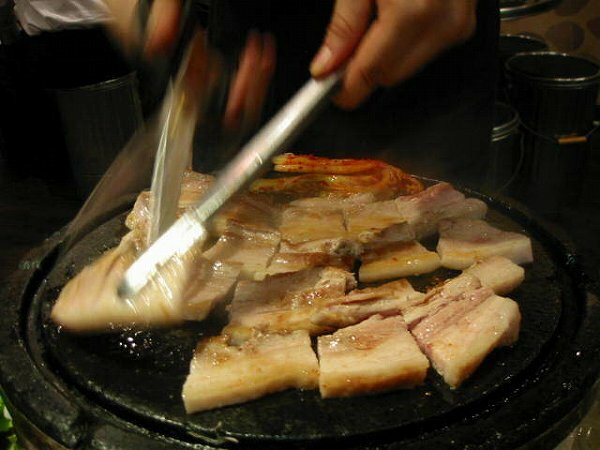 The pork belly will be grilled on a pan made by stone with Kimichi (Spicy Pickled Chinese Cabbage). The stone pan has a hole at one of the ends and is tilled, so pork belly fat drips out through this hole. The cooking will be done by the waiter, so once you order just leave everything up to him. He will cut it into pieces and when its done he will tell you that's its ready. Pork belly itself isn't seasoned, but to make it tasty Goma-Abura (Sesame Oil with Salt), Tenjan (Korean Miso), Negi (Seasoned Shredded White Scallions) will be available with Sanchu (Korean Lettuce). 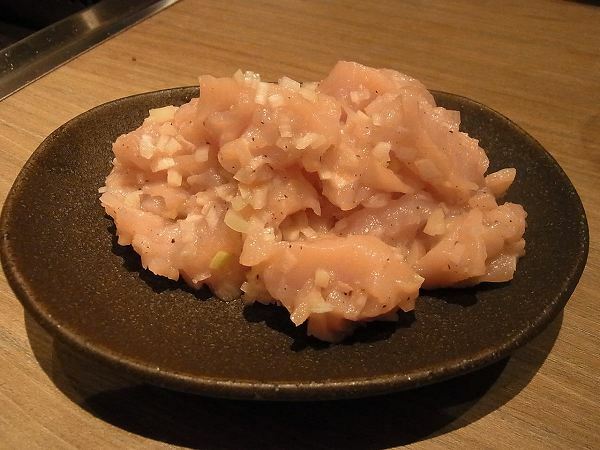 The proper way of eating it is to take a piece of sanchu in one hand, then get a piece of pork belly, and dip it in sesame oil with salt, put it on the sanchu. 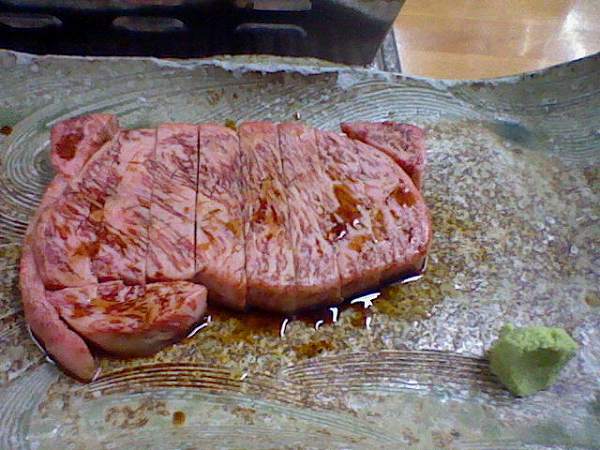 Get some tenjan, paste it on the pork belly, get some kimichi & garlic cooked on the stone pan, and also add some negi. Rap it up and eat it. 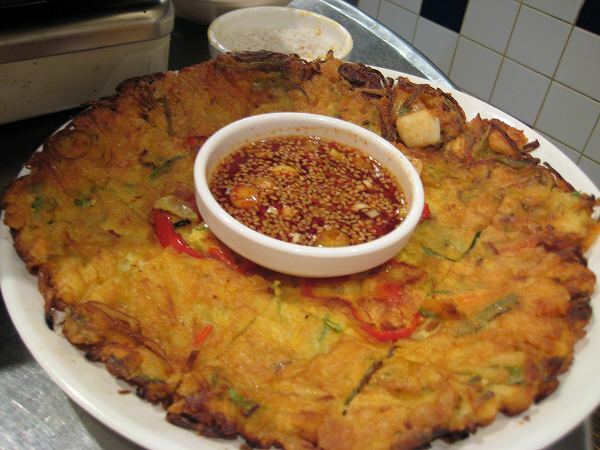 The dishes which you might wanna order as an appetizer is Kaisen Chijimi (Seafood Pancake) 1,344 yen. 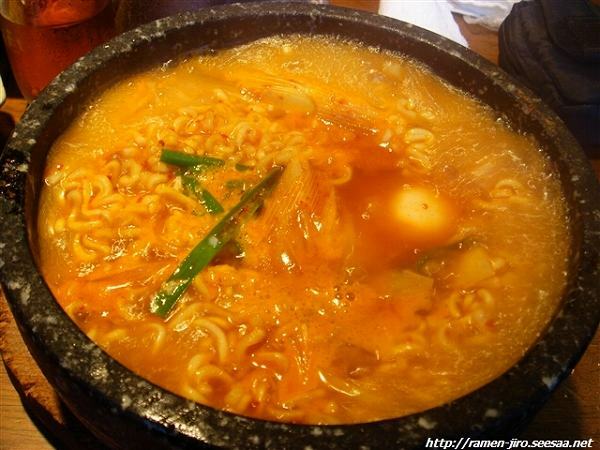 While you are eating sam gyeop sal you might want some soup to accompany it. 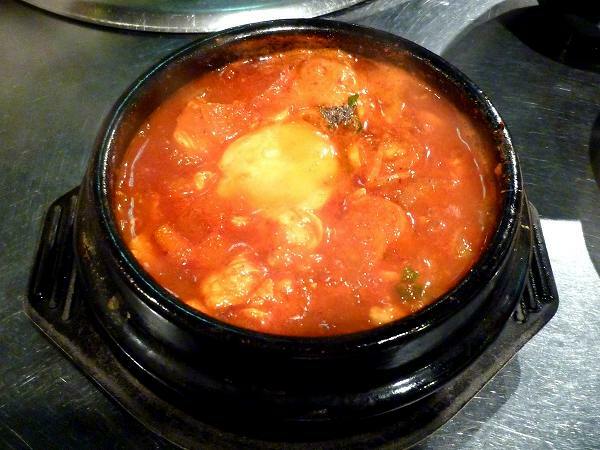 I would recommend to order Soon Doo Boo (Spicy Tofu Soup) 1,029 yen. 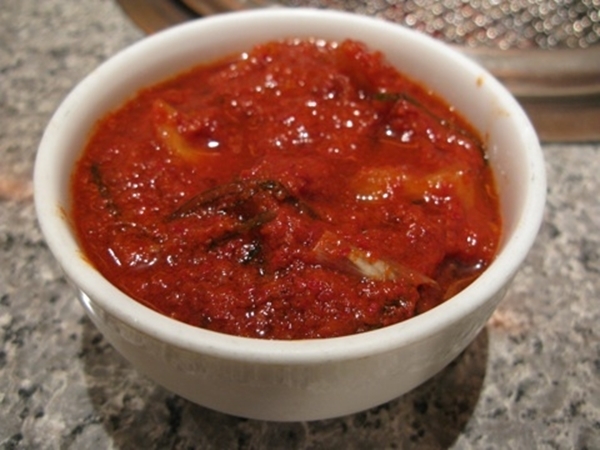 Its not spicy as it looks and if you are a group of 2-4 people, just order one and share it. 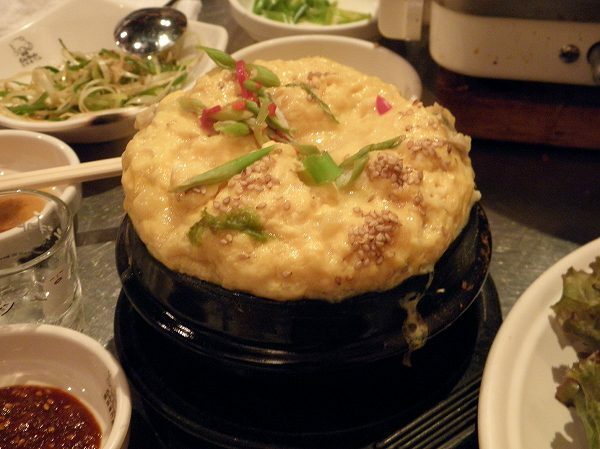 Another item which everyone likes is Tamago Chim (Steamed Egg Omelette) 1,029 yen. Its really fluffy and tasty. 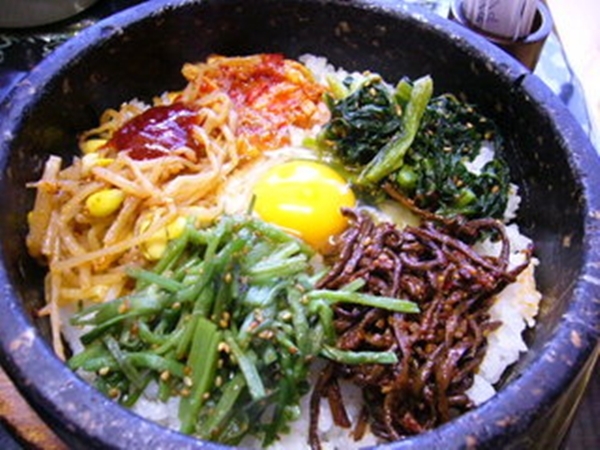 And when you are done eating sam gyeop sal, you want to end your meal with Yakimeshi (Fried Rice) 525 yen. One order should be enough for 2 people, so order 2 yakimeshi's if you are a group of 4. You can add topping as well and almost everyone orders Cheese 210 yen extra. It will be cooked right in front of you by the waiter. Some of my friends say this is the best part of the whole meal. 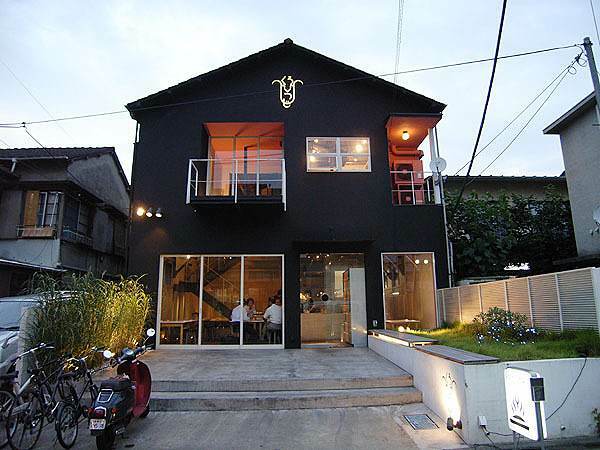 Unless you don't eat pork, this is one of the best restaurants in Tokyo in so many ways. I have brought many friends and clients (Japanese and foreigners) here and all of them come back on their own with family and their friends. Only problem is that only branch which takes reservations is Akasaka, but even Akasaka doesn't on Sundays & holidays. 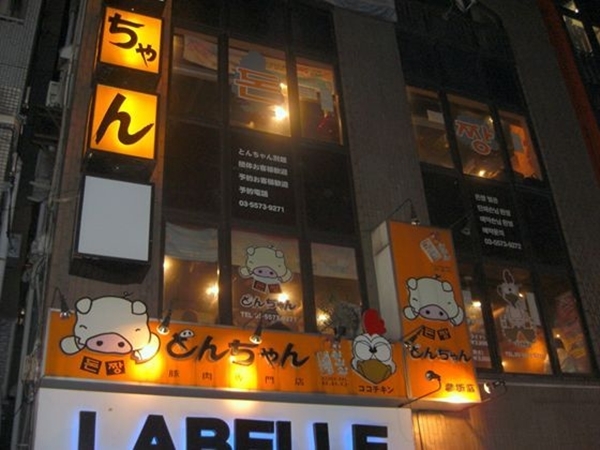 Other locations are Shinjuku, Shin Okubo (2 stores here), Shibuya, Ebisu, Ikebukuro, Takadanobaba, Gotanda and Ueno. 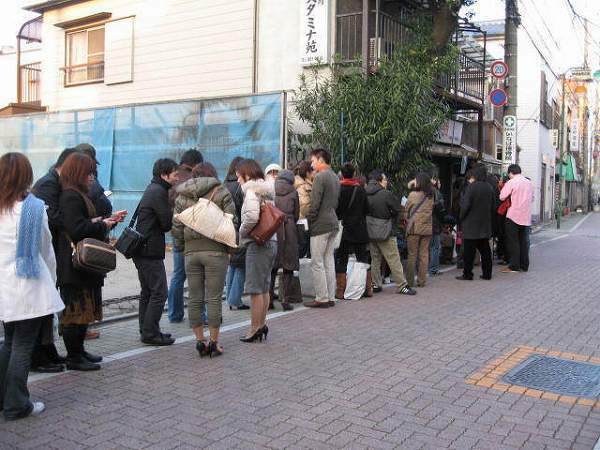 All the locations tasty the same, but you might wanna avoid Shinjuku, Shin Okubo, and Shibuya since the wait can be for over 1 hour.